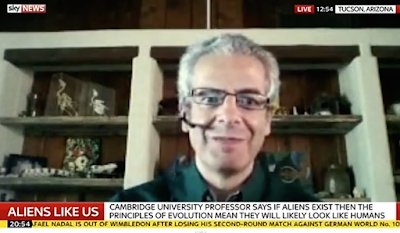 UFO SIGHTINGS DAILY: Nick Pope, Former Govt UFO Investigator Says Aliens Could Be Out There, July 2015 Interview, UFO Sighting News. Nick Pope, Former Govt UFO Investigator Says Aliens Could Be Out There, July 2015 Interview, UFO Sighting News. Here's part of an interview I did for Sky News yesterday, commenting on Professor Simon Conway Morris's remarks about convergent evolution in relation to extraterrestrial life. I also cover SETI, and the MoD's UFO investigations.